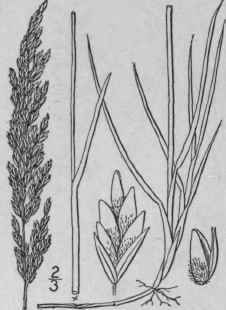 Poa compressa L. Sp. PI. 69. 1753. Pale bluish green, glabrous, culms 6'-2° tall, decumbent at the base, from long horizontal rootstocks, smooth, much flattened. 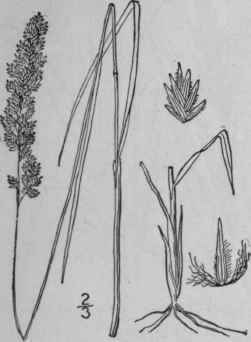 Sheaths loose, flattened, shorter than the inter-nodes; ligule 1/2" long; blades 1'-4' long, about 1" wide, smooth beneath, rough above; panicle usually contracted, the branches erect or ascending, 1' long or less, spikelet-bearing nearly to the base; spikelets 3-9-flowered, 1 1/2" - 3" long; lower scales acute, 3-nerved; flowering scales 1"-1 1/4" long, obscurely 3-nerved, the nerves sparingly pubescent toward the base. Waste places and cultivated grounds and woods almost throughout North America. Ascends to 2100 ft. in Virginia. Naturalized from Europe. Native also of Asia. Varies from weak and slender to quite stiff. Squitch-grass. June-Aug.
Poa arachnifera Torr. Marcy's Exped. 301. 1853. Culms tufted, 1°-3° tall, smooth and glabrous, from running rootstocks; sterile shoots from one-half as long as the culms to equalling them. Sheaths longer than the internodes, smooth or roughish, hyaline on the margins; ligule a short membranous ring; blades linear, erect, usually folded when dry, smooth beneath, rough above, 1 1/2'-9' long, 1 1/2"-3" broad, abruptly acute; panicle dense and contracted, sometimes interrupted below, 3'-6 1/2' long, 1/2'-1 1/2' broad, its branches ascending or erect; spikelets numerous, 4-7-flowered, the scales acuminate, the empty ones hispidulous on the midnerve; flowering scales 2"-2i" long, often pointed, pubescent at the base with copious long cobwebby hairs, 5-nerved, the midnerve and lateral nerves pilose below the middle. Prairies, Kansas to New Mexico, south to Louisiana and Texas. Also introduced in Florida. April-May. P. eminens Presl, Rel. Haenk. 1: 273. 1830. P. glumaris Trin. Mem. Acad. St. Petersb. (VI.) 1: 379. 1831. 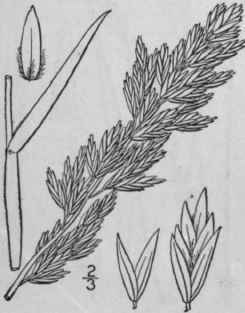 Smooth and glabrous, culms 6'-3° tall, erect or assurgent, simple. 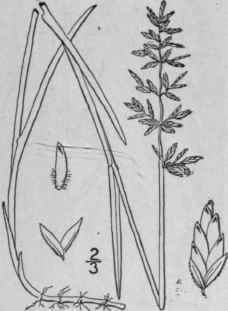 Sheaths loose, usually shorter than the internodes; ligule 1/2' long, truncate; blades 4'-10' long, 1"-4" wide; panicle 4'-10' in length, the branches erect or ascending, 1'-2' long; spikelets 3-5-flowered, 4"-6" long; lower scales about equal, acute, slightly scabrous on the keel, the first 1-3-nerved, the second 3-nerved, rarely 5-nerved; flowering scales 3"-4" long, usually acutish, scabrous, 5-7-nerved, pubescent at base and on the lower part of the midnerve and lateral nerves, not webbed. Beaches and shores, Labrador to Quebec, Washington and Alaska. Summer.